What's in a name? When you're talking about "The Expendables 2," that's pretty much all there is. The first "Expendables" was, once you got past the giddiness of seeing a bunch of famous action stars all in one movie, a mess. Convoluted. Nonsensical. And most unforgivable of alll: Boring. So what is the plan for the sequel? ADD MORE NAMES! OK, that's a pretty cool addition. But he's apparently playing a character called "Jean Vilain." Seriously. "Jean Vilain." Which is like calling him Jean-Claude Van Bad or Pepe Le Evil. Wow. 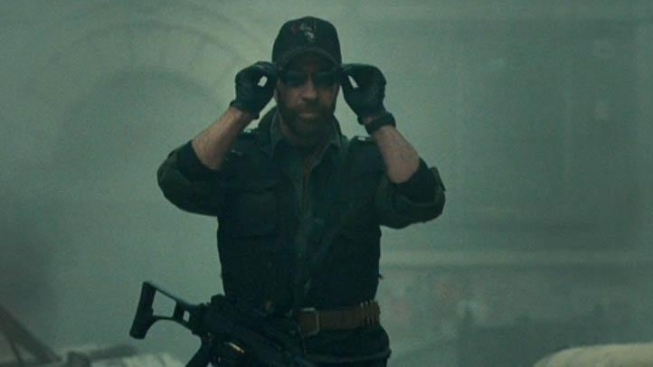 Expendables just went DefCon Chuck. Well played. But...you know...Liam. Not Chris. Sorry. "The Expendables 2" is coming August 2012. No need to set your calendar. Chuck Norris is going to drive around the country in a van forcibly dragging people to theaters next summer. You were warned.